I might have to rename this blog “Mostly Stitching”, or “Things Made of String” or something because today I have yet another TAST embroidery sampler to show. I didn’t feel like I had given shell chain enough attention when I made my catch up samplers a while ago so I thought I’d have a play with it. I call this my “Groovy Guru, Mr. Crab” sampler. Mr Crab is a pressed metal decoration that holds up our house number on the front of our house. I wanted to try lots of different threads and also try making the stitch wider. The sunset is worked in two different variegated stranded cotton flosses. The waves are a line of handspun wool and a line of mercerised cotton. The water plants and ground are silk/wool worsted weight knitting yarn, various mercerised cottons and crewel embroidery wools. Next I decided to play with making more loops for each stitch and changing the direction. 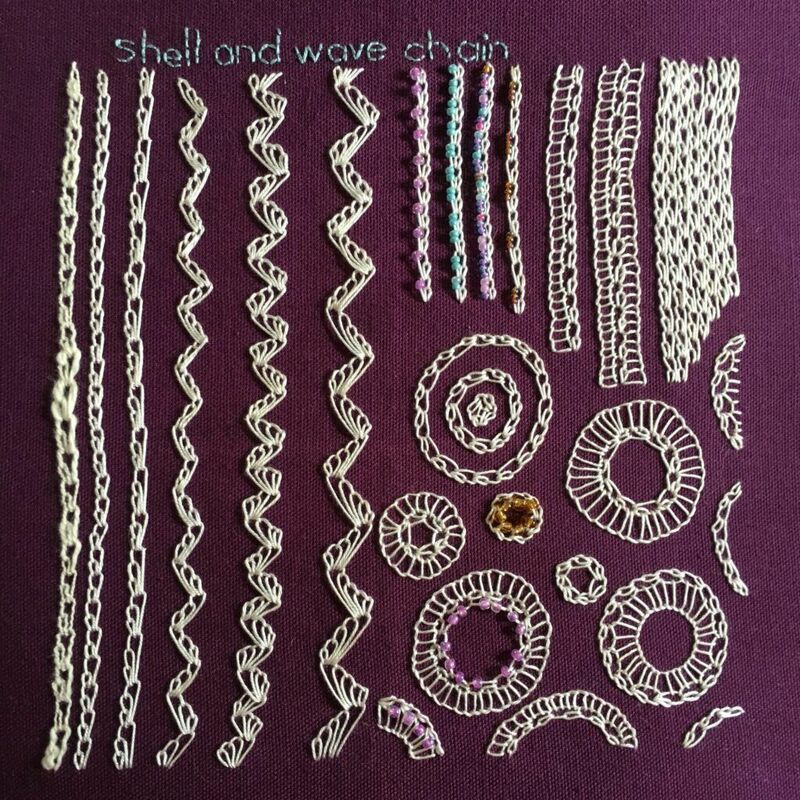 I found out that version of shell chain is called “wave chain”, so whilst wave chain is not officially a TAST stitch (yet? ), I added the name so I know later on. This sampler is mostly stitched in what I think is called number 16 floche. The downside of using op-shopped threads is that they sometimes have no label! Anyway, it’s roughly the size of two strands of floss. The first line of shell stitch on the left is my beginner handspun cotton, and the rest is the floche. I basically tried everything I could think of. It makes a great filling stitch. It’s a lovely textural stitch for layering with the same, or different types of thread. I need to draw parallel lines when working wave chain. 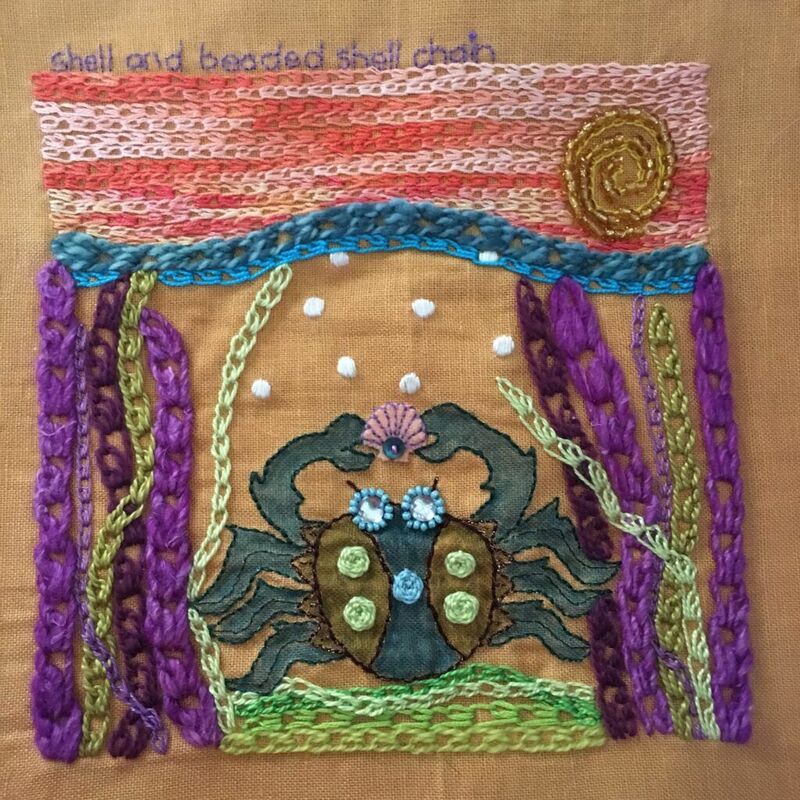 Shell chain LOVES blanket stitch. I tried all different combinations of shell chain and blanket stitch together but I think my absolute favourite is the circle near the bottom right corner. So my feelings about “dull” little shell chain have completely reversed. I love it. In fact, I can see myself stitching shell chain and blanket stitch circles on more than one future project!